Every single “point” here smacks of an abuser’s language and dismissive words about their victims’ pain. A manipulative abuser will terrorize a family member or “loved” one until the target leaves, then the abuser will play victim and tell everyone they are sooo sad, and they just don’t know why the “mean” victim won’t have anything to do with them. They easily fool onlookers by pretending to care and to be innocent and hurt because someone cut them off for supposedly no reason. Abusers–especially abusive parents/grandparents–love to use the children as pawns. Oh, if you cut contact to protect yourself from their bad behavior, the poor children will suffer! Such drama. Don’t forget–the parent who abused you will be the parent who will abuse your child, or disparage you to your child. Unfortunately, the abuser that you try to escape will guilt trip you over your children, and they will make you into a monster for “stealing” your children away from a grandparent. Abusers dismiss years and years of ongoing abusive, and cruel behavior as nothing. They will say things like this was “all about ego” as if you have no reason to be upset, no reason to avoid them, and you are upset about some tiny, one-time incident. Furthermore, they will tack it all on you. There’s nothing wrong with them in their minds; the problem is all you and your “ego.” Never mind that your decision to stop talking to them is the result of dozens, hundreds, thousands of horrible things they have said and done! Oh no, in their heads, you weren’t abused by them. You are just petty and “offended.” How silly of you to want to avoid some who treats you badly, right? And of course, to an abuser, your legitimate complaints and concerns are all imaginary. They will rolls their eyes, (or like my narcissistic mother, literally wave their hands,) because they don’t want to hear what you have to say. They don’t care that they hurt you. They will never admit that they were wrong. This conflict isn’t due to their ongoing drama and insanity. It’s all in your head…so they want you to think! Finally, they end with that narcissist classic–the ultimatum, the guilt and the fear that you might miss out. No, don’t be too late! You’d better come back and take more abuse before they die and you feel bad for missing out on such great memories right? Gag! And of course, a narcissist would use all these rationalizations and share them with their flying monkeys and enablers to make you the bad guy for being healthy enough to say “no more.” Frankly, this meme relies so heavily on dismissal, guilt and manipulative words that I wouldn’t be the least bit surprised if an abusive person wrote it! The whole thing is toxic. Agree with you entirely. Reminds me of a blog I read about estranged parents forums. They don’t ever want to validate that there may be good reasons for no contact. Abusers crave that level of control and will manipulate the people they’ve hurt into seeming like the bad guys. Great post. I am triggered by the word imaginary, and can understand where you are coming from. If this meme was on a narc site, I’d have steam coming out of my ears! Since this was on Facebook, I see a different message, that doesn’t trigger me, and I think it’s a good meme. I see the two perspectives side by side. One doesn’t invalidate the other. In a narcissistic family, family members feed on another family member, blame the target, and try to set them up to do it again. There is no potential for a good relationship. In that situation, the meme means “forgive and forget,” which is a trap. It just resets the cycle of abuse. Most family conflicts don’t involve a pathological narcissist, or the underlying abuse, intention and flying monkeys that come with them. 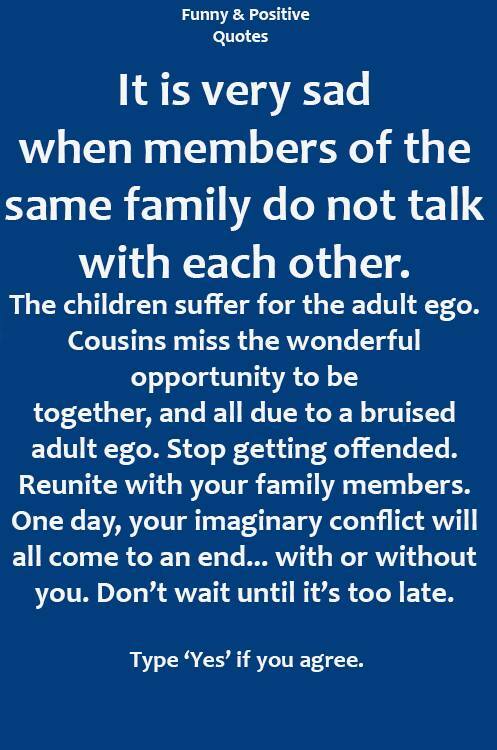 In normal/dysfunctional families, it often is bruised egos that keep people apart, and getting past that brings good things. That meme is for people dealing with a cousin or sibling who has a conscience, actually cares about them, has a shared goal of having a normal relationship, sees truth as common ground in resolving conflict, is willing and able to be accountable and apologize, etc. (I am going on faith that people like that exist, I haven’t personally seen one! Lol). Regarding trivializing their pain… I think this is an apples to oranges comparison, too. Asking someone to minimize pain from a wounded ego is different than invalidating the pain of an abuse victim. Pain from narc abuse is destructive and cuts to the core. With a scapegoat, it even involves abandonment, which is a primal wound. A primal wound can only get worse, it can’t heal. (I.e. You can’t repair it, you have to learn to manage it.) Wounded ego pain is a different category. I don’t think those people would be triggered or offended by the meme. Thank you for all your wonderful articles. They have been an invaluable resource! My narc ex all but discarded our 13-year-old son and 10-year-old daughter. Why? Because they started standing up and speaking out. Because they no longer wanted to deal with the b.s. and dysfunction that was him and his “supply” who is also a narc. They have not have had an overnight with him since just after Christmas. He blew off our son’s IEP and our daughter’s spring concert and AWANA closing ceremony. He has not called or sent a text since last month. He did nothing for them for Easter and he blew off Mother’s Day but he was kind enough to send me a text saying how they don’t seem to know or care what them not coming around was doing to him, that they are only concerned about themselves, and that they won’t even try to see if things are better, and that he hopes they realize the hurt and pain they are causing. The pain that they are causing. They made this choice because of his choices but he refuses to get that. Thank you so much. I only fully identified my younger sister as a psychopath/narcissist around 4 years ago – I am 62 years old. I actually broke off all contact with her around 10 years ago as I knew she was completely selfish, dishonest and very manipulative. I had grown to hate her attitude – even her company. But I have another older sister who is a gem! Totally honest, very caring, a great mother to her six children & a very good friend & sister to me. This sister finds it difficult to understand how I have completely distanced myself from the awful younger one and really doesn’t like the family atmosphere that has created. I am looking forward to showing her your article as I believe it will better explain how I’ve made my choice, than I could explain myself. I agree with Amy’s comments about family members falling out over bruised egos and really needing to just get over it. It is a good thing to heal wounds whenever you can – indeed the whole process and experience can be rewarding and very satisfying. However, with the psychopath/narcissist in my life, I don’t think I could ever feel comfortable even being around her again. There is not a wound between us – its more a case of fundamental differences in the way we lead our lives, the way we treat others and the way we want to be treated. Having finally discovered the sad truth about my younger sister (and part of me does feel sad that she was born the way she was) I know I could never enjoy any part of a relationship with her again. A resolution or healing is only worth seeking if you know you want it – I don’t! It’s not a matter of ego – more the absolute knowledge that no resolution is even possible. Please keep posting your thoughtful articles, I look forward to them, I read them all & I always learn something new each time. Thank-you for this post. My NPD mother posted the meme and you put to words my visceral reaction. The meme was used to invoke guilt, even my husband said “Man, I feel so guilty.” Yet he’s watched as they(she has many flying monkey’s) continue to invoke harm. He agreed this post was spot on. Thanks again!!! This IS my mother! The narcissists of ALL TIME!! She is a covert narc, the sweet little ole lady who would never hurt anyone. BLAH! This evil hateful woman has caused me more pain and heartache, lied lied and lied again about me. Then started doing all the same things to my daughter when she was only 10. That was it for me. I cut all contact with her and my 2 sisters 4 years ago all because of YEARS of my mother’s abuse. Now she uses my no contact as a way to gain pity and sympathy. She just can’t believe I won’t have anything to do with her and that I keep her grandkids away from her! EXACTLY the reason why I do, she’s a malignant narcissistic PSYCHOPATH! NEVER EVER AGAIN!